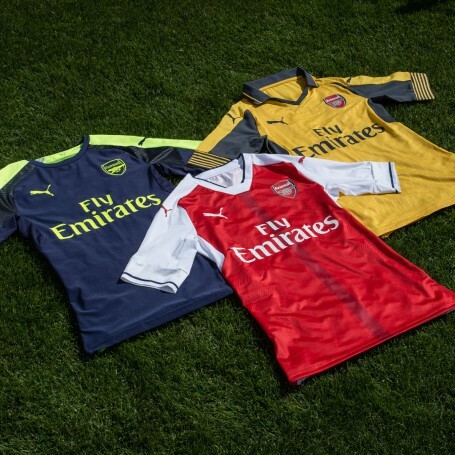 PUMA has revealed the new Arsenal Away and Third kits for the 2016/17 season, created with two contrasting looks. The Away kit has a classic design, with a colour palette inspired by the Gunners’ foundations in the Woolwich armaments factory, The Royal Arsenal. Arsenal’s bright future and innovative outlook is the basis for the design of the more modern looking Cup kit. Designed in the iconic Arsenal Away yellow rounded off by gunmetal grey details – a subtle nod to Gunner’s factory foundations, PUMA has created a traditional kit that celebrates the club’s rich history. Featuring Jacquard pinstripes, the yellow shirt has a unique tailored look. Additional design features include a grey fold over collar with yellow stripe detail and grey sleeves complimented by a yellow PUMA Form Stripe. Rounding out the design, the shirt features the PUMA Cat and Arsenal crest on the front, with a subtly placed Gunner’s cannon on the back neck area. Taking inspiration from Arsenal’s constant drive to look to the future, PUMA has introduced a contemporary Cup Kit with an ultra-modern look and feel. Designed in a dark peacoat hue, the kit is complemented with bright injections of Safety Yellow in the PUMA Form Stripe along the sleeves and cuffs, shorts, and in the block colour socks. Finishing off the overall design, carbon surface sublimated sleeve inserts on the shirt provide a futuristic look. The performance shirt worn on pitch by the players features PUMA’s new apparel technology ACTV Thermo-R, strategically inserted in both the front and the back of the shirt to help players maintain an optimum body temperature. A unique phase-change material is injected into the shirts’ inner athletic tape, which allows microcapsules to absorb excess heat and release it back to the body when needed. The taping in the shirts provides an extra snug fit, micro-massaging the skin in specific areas to enable a faster, more effective energy supply to the active muscles.